Advances Mobility - Health and Independence The Folding Exercise Peddler with Electronic Display by Drive Medical is simply unbeatable when it comes to helping you increase your mobility and circulation as well as the strengthening of your legs and arms. The combination of these benefits can greatly boost your overall health and independence. 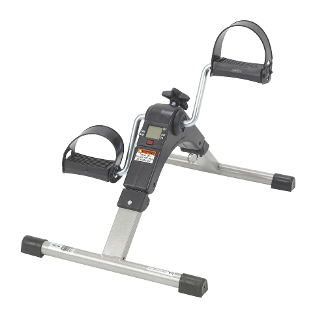 As a leading edge exercise machine, this peddler is sturdy yet light-weight and comes complete with an attached display. The peddler monitors and records five different functions that can help you improve your overall health and well-being. The display includes a scan feature that allows you to monitor the calories you're burning, how long you've been exercising, as well as your revolution count (rpm) per minute. Another handy feature you'll enjoy is the ability to time your workouts which allows you to track and measure your progress. This fabulous piece of exercise technology offers you exceptional value. You'll also love the fact that this Folding Exercise Peddler with Electronic Display is easy to fold up and take with you while travelling for pleasure, or on business. Go ahead...Experience the Drive Difference Now!